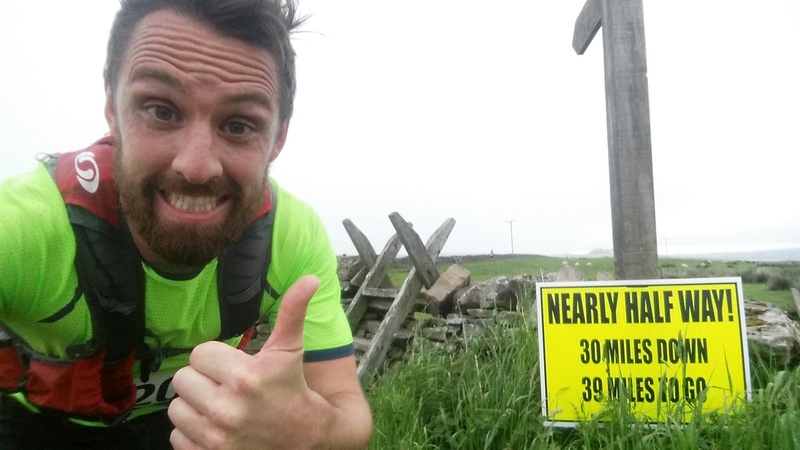 Okay wow, I just took on my biggest single ultra to date; Rat Race’s The Wall is a 69 mile one day running challenge following alongside Hadrian’s Wall from Carlisle to Newcastle. This was a feat I wasn’t honestly sure I could complete. 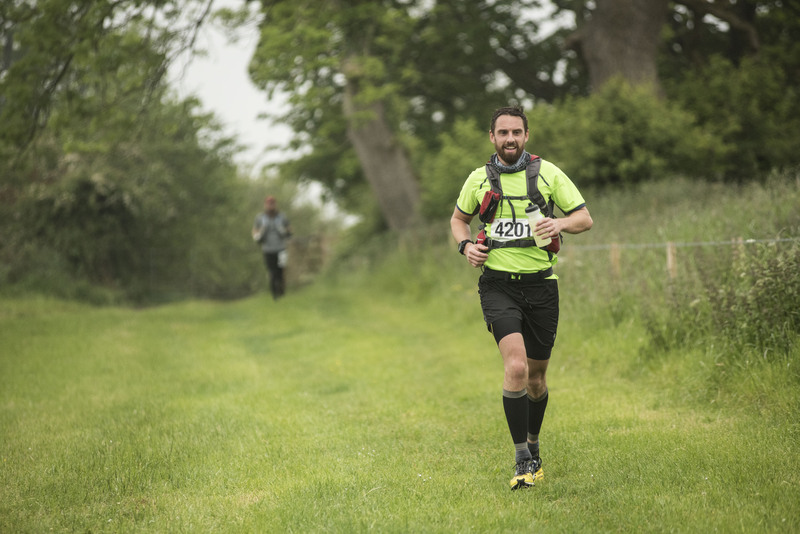 In the few weeks prior I’d only been running occasional 5k’s in my lunch breaks as I was supposed to be recovering from the Marathon des Sables and a 40 mile obstacle race (one of Rat Race’s other treats). 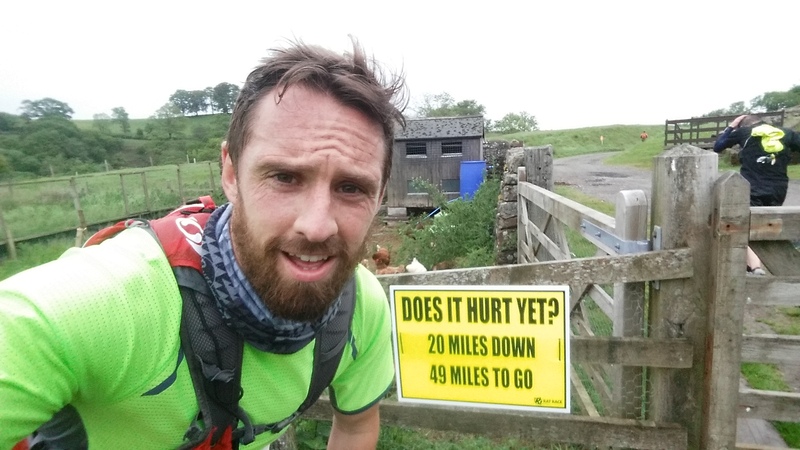 So a few 5k’s weren’t exactly optimal training for the UK’s biggest ultra but maybe the rest would have done me some good…? 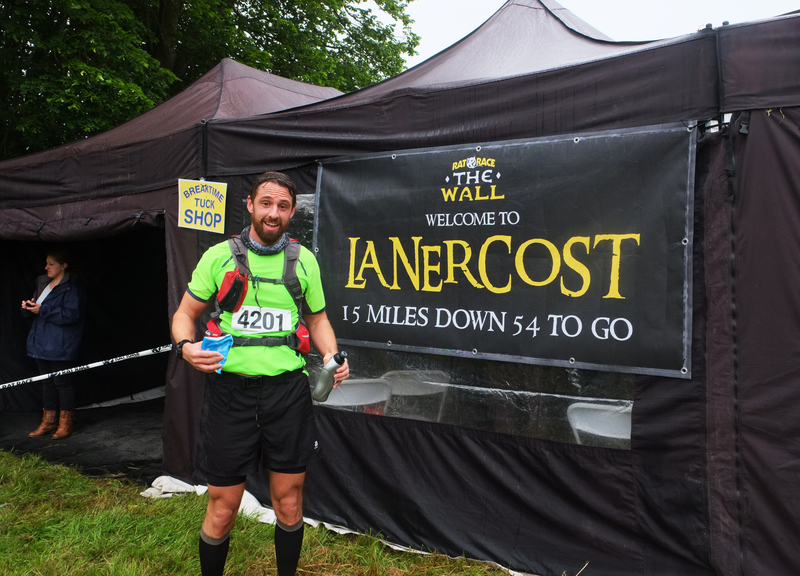 I’d seen this challenge to run ‘The Wall’ a year or so ago and loved the idea of it but was far from ready having not even run a marathon at the time. I’ve since spent the last year training for Marathon des Sables which I completed in April so now hopefully have the foundations to take on a few of these biggies! Feeling good but not even halfway! An anxious group of around 500 slightly damp and chilly hopefuls gathered in the grounds of Carlisle Castle for a 7am start to head right across the country to arrive in Newcastle in the not-to-distant future, the sooner the better for me! My main aim was to get there before dark so as not to need the head-torch and hi-vis gear we had to carry among a few other essentials. From the start like most people I set off a faster than I should have but did my best to keep the pace and did a pretty good job too for a couple of hours. At the 15 mile pit-stop I was in 9th place and only 6 minutes behind the leader, go me! I reached the 32 mile mark in a respectable five and a bit hours hanging on around 25th but still had to dig deep to keep a decent pace for another 37 miles! You know it’s a long when you’re relieved that it’s ‘only 19 miles to go’. It was a very tough and long day but I have to say the event was really well put together. For such a long distance through towns, country lanes, trails and farmland I didn’t once go off track, the course was well marked including motivational signs at certain points, that is if it counts as motivational telling you you’ve got ‘ONLY 49 MILES TO GO’, ‘DOES IT HURT YET?’ To be honest the only one I found slightly upsetting was at 60 miles with 9 to go when my GPS was telling me I’d done 62. That was somewhat disheartening to say the least. There were alternating manned checkpoints and pit-stops along the course. The checkpoints were hosted by cheery and helpful volunteers egging us on and offering water and sweets which I would just grab and go. At the Pit-stops however our timing chips clocked us in for the splits and we had an array of drinks and snacks to choose from. Many runners took some time out here to put their feet up, munch down a few sandwiches, crisps and sugary treats until they felt ready to go again. The crowds and atmosphere were great and at the 32 mile stop there was even a DJ on the back of a truck and the party was booming! 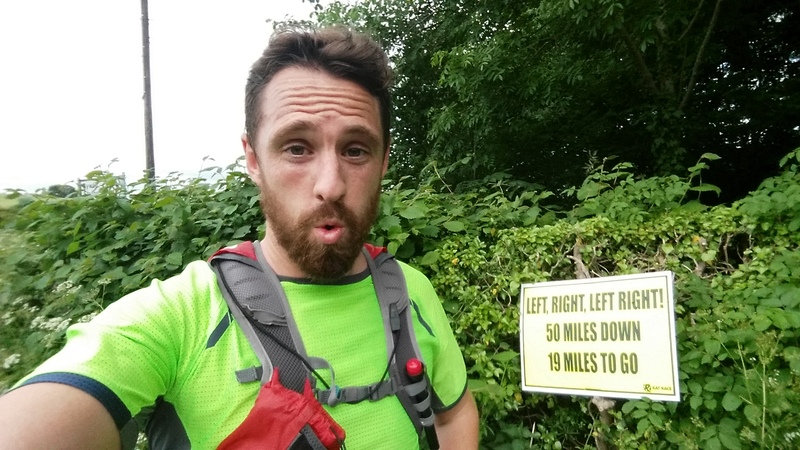 I chose to quickly glug down some soup and snacks, have a little dance (this really happened) and then clear off again with just a mere 37 miles between me and my glory. 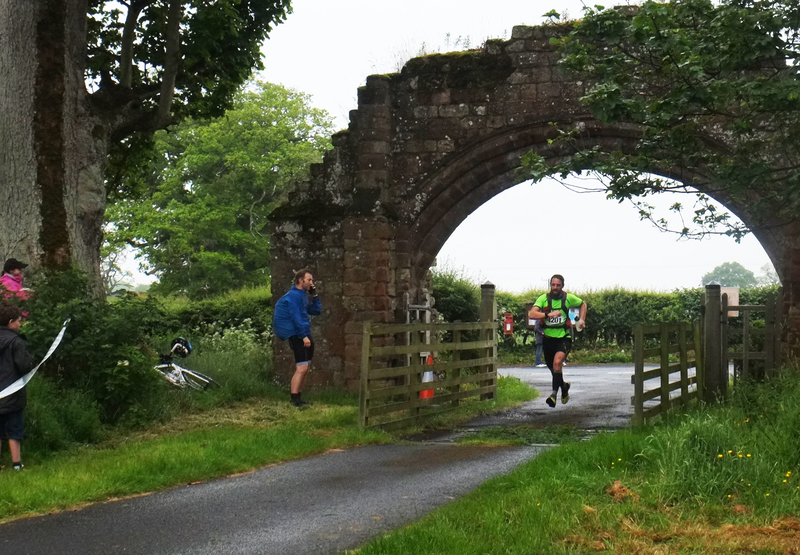 Following remnants of Hadrian’s Wall we weaved through tiny villages, across fields, over stiles and cautiously along country roads. 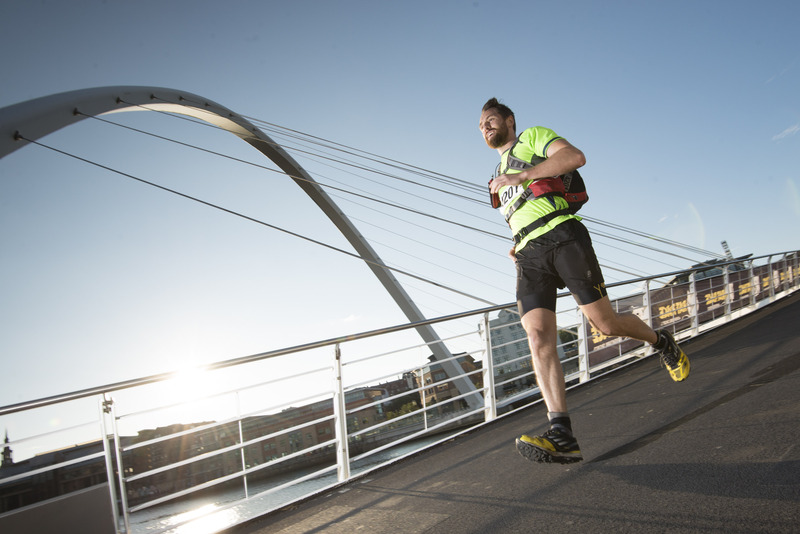 It’s a comfort to latch on and partner up with other runners around the same pace, have a chat and help keep each other going. In the first ten miles or so I’d been running with a few guys one of whom (Ian) went on to be the winner smashing the course record, another two eventually went off ahead of me as I eased off the pace. Several hours later I caught up and passed one of these guys Chris who was on his 9th of 14 challenges raising money for Cystic Fibrosis. An hour or so later I was surprised to see the other guy Matt emerged from a bush having been sick for the 5th time. I stuck with him for a few miles force-feeding him crisps and sweets until he got some strength back. 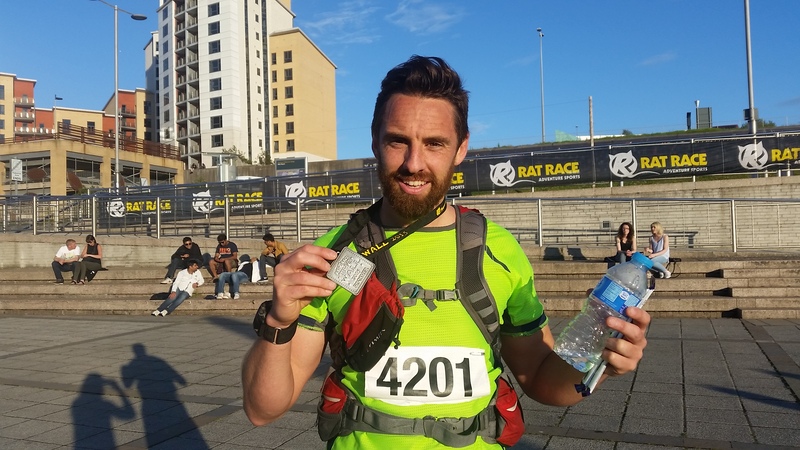 The last few miles were tough but I eventually reached the Millennium Bridge to cross the finish line almost 13 hours after I’d set off placing 43rd which I was more than happy with. The pain has almost faded but the glory is still beaming from my proud smile, this was a great event I’d certainly recommend to anyone wanting to go that extra mile (or 69). 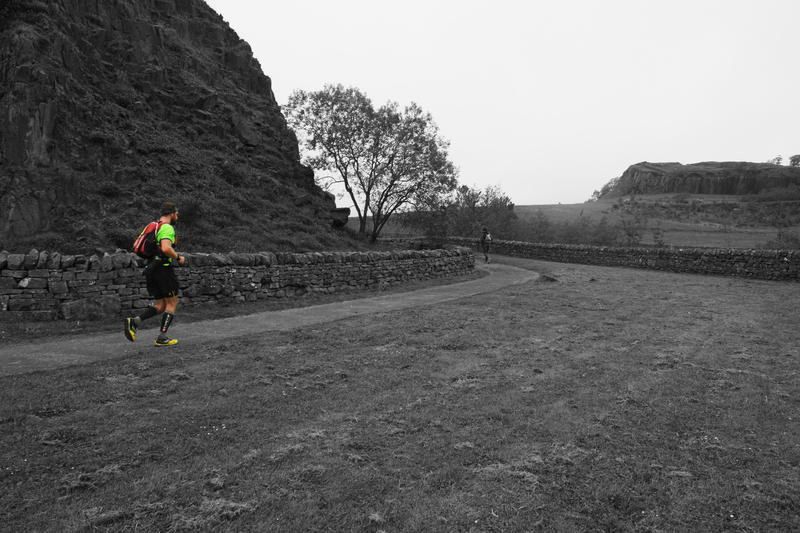 Intrepid Series Stage One – 8 Miles + The Pit! Cathedral abseil for its 900th birthday, yes please! £26,000+ – Amazing support for Rory and family.